I put together this post and findings as a result of my previous experiment about content syndication on LinkedIn, Medium, and your site. Here are those results. 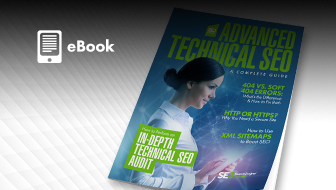 From link building and SEO to gifs and Instagram, I’ve had a blast writing for Search Engine Journal (SEJ) every month for the past six months. And, more than 20+ articles later, I’ve been looking for new ways to gain more engagement on my old articles. What began as a curious experiment has grown into an ongoing content marketing distribution strategy for myself and, hopefully, SEJ. In the beginning, I had a lot to learn about how to syndicate content on Medium and LinkedIn. It’s hard growing an audience. There is a lot of work involved. And, you have to have the right kind of content for each platform. The truth is, I still continue to learn new things about how to best repurpose my content — all of which I’m excited to share with you. In this post, I’m happy to share some of my experiences of repurposing my content from Search Engine Journal to Medium and LinkedIn. I hope these lessons will be helpful for you as you start and distribute content across multiple platforms. I’m grateful to have the opportunity to partner with SEJ to research some of the top performing brands on Medium and their content syndication strategy over the past couple of months. I’m really excited to have learned (and now I’m able to share) with anyone interested in the specifics. 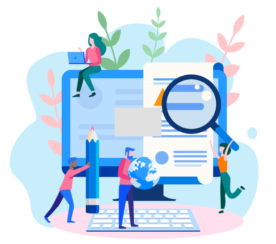 If you’re new to content syndication strategies and how best to syndicate your content, check out this article by Amanda DiSilvestro. 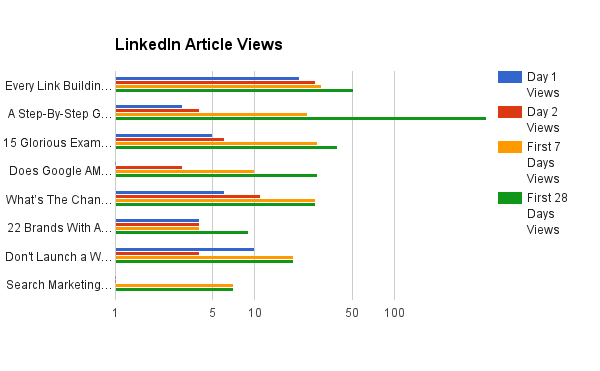 I used a tiny sample size to audit performance on Medium, LinkedIn, and other sites for repurposing content. It’s fair to assume this data is not prevalent for all brands or industries. I chose to share the most interesting findings versus all of the findings to keep things sweet and straightforward. Publishers are, in fact, repurposing their content from their site to Medium, LinkedIn Pulse, and other top publishing sites. What performs great on one platform, doesn’t mean it will perform well on another. Success comes with help from the others and building a community. Below I go into further detail explaining this experiment. Who are the Big Players Repurposing Their Content? I analyzed the latest ten articles of favorite brands on Medium. I wanted to know what is working for them. How do people promote their content on Medium? Do they repurpose it LinkedIn? Or, other publications? I didn’t know. I’ve never syndicated my content to Medium or LinkedIn. Here’s what I found after analyzing my favorite brands. Note: This is only a sample size of brands who are dominating on Medium, LinkedIn, and content syndication. I recommend you conduct your research for your niche industry before moving forward with these tips. Good luck! 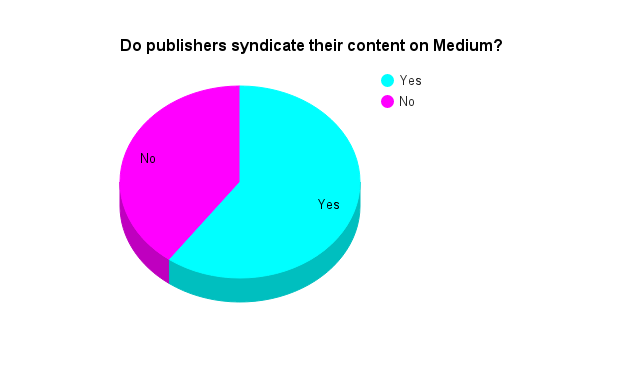 Do Publishers Syndicate Content From their Blog to Medium? 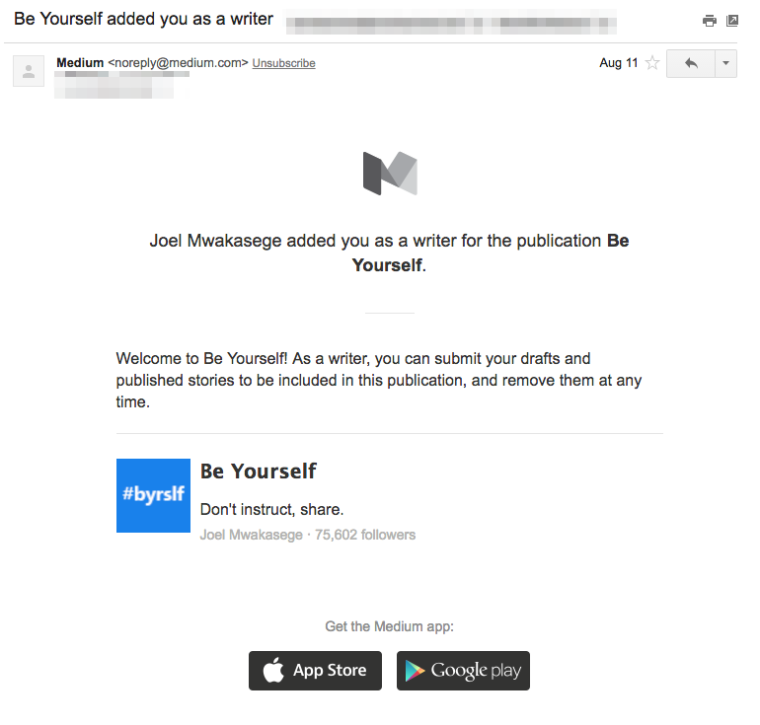 Publishers are syndicating content from their main website to Medium. After looking at this small group of publishers, I found that brands mostly posted to their main website blog first before repurposing their content to Medium. It makes sense, seeing as both hold SEO benefits. 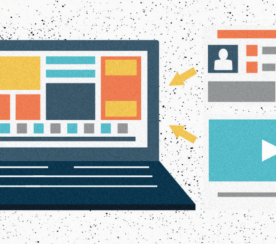 Convince & Convert syndicates recent pieces from their blog. ReadThink (HubSpot) does not syndicate content from their blog, but they do syndicate content from guest writers like Larry Kim whose article has been featured in multiple locations. For example, this post was featured on Inc. before publishing on ReadThink. Buffer syndicates old content from their blog. Typically, the content Buffer syndicates on Medium has also been syndicated on other publisher sites like Huffington Post, NextWeb, etc. Here’s an example of a piece that was published in April 2013 on Buffer that was then repurposed on Huffington Post in January 2014, then finally posted to Medium in August 2016. Fast Company syndicate’s new pieces from their magazine. Product Hunt does not syndicate content from their blog, but Ryan Hoover, the founder of Product Hunt, does repurpose his Medium articles to LinkedIn Pulse. 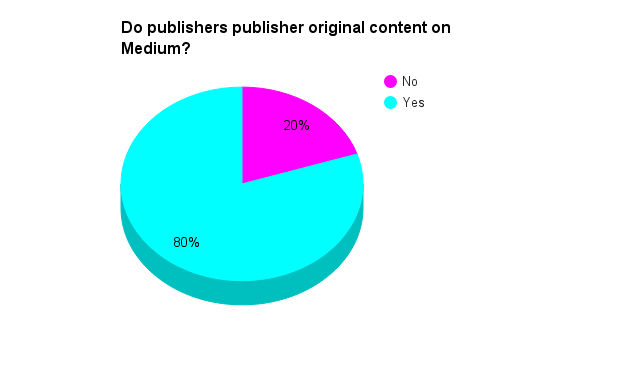 Do Publishers Post Original Content to Medium? 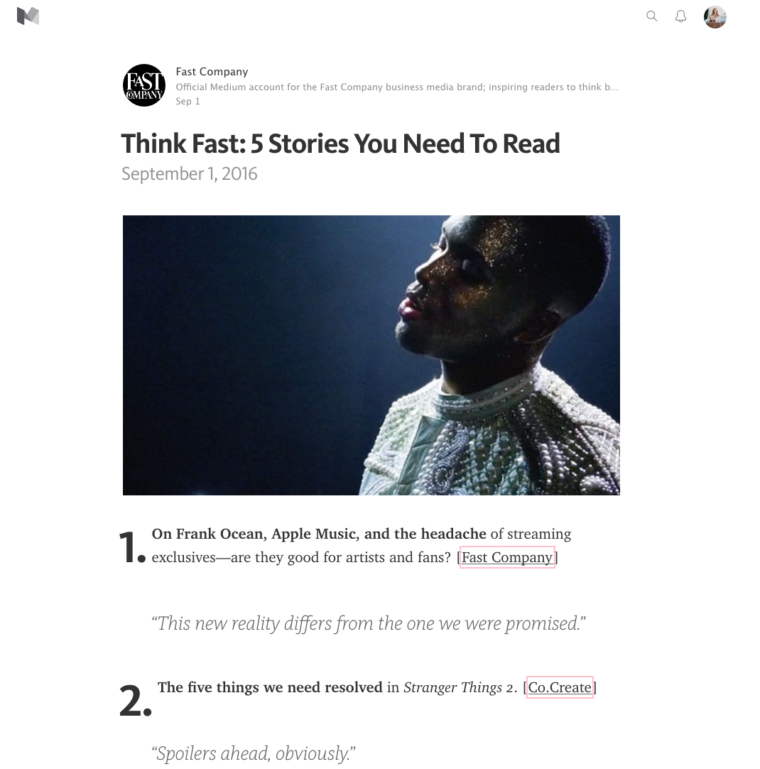 In addition to repurposing content on Medium, publishers are sharing additional original content to Medium. For this part of my research, I looked at the top 20 posts of each publisher to determine if the content was syndicated or original. I found that the majority of publishers from this study are posting original content to Medium, in addition to their syndicated content. 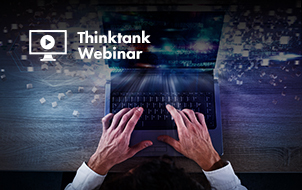 The syndicated content takes up the bulk of the content, whereas the original content was sprinkled in here and there except for ReadThink (HubSpot). It’s interesting to note that brands appear to be utilizing a wrap-up or round-up of posts format to share an original post with links to their other repurposed content. It feels like they may be using these as a way to format their letters on Medium for an easier read. 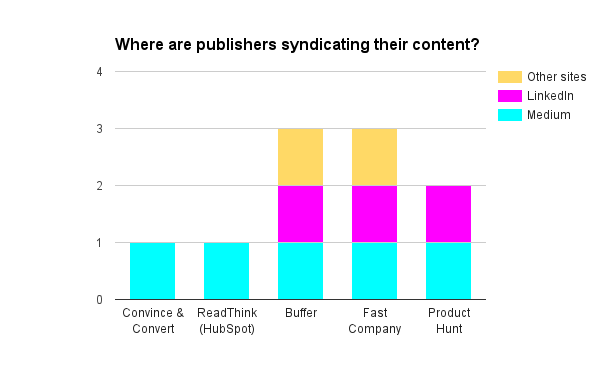 Where Do Publishers Syndicate Their Content? They are syndicating content on multiple platforms like Medium, LinkedIn, and other big sites. This data was fascinating to me to see where each publisher was reposting their work. I found that it was an even mix of the brands. Each publisher strategy is different based on their needs. I was a surprised to see that not many of the brands I reviewed were syndicating their content on other big sites like Business2Community, Inc., or Huffington Post. Understanding the differences, patterns, and changes to these brands and their content marketing strategy shifted my vantage point. The only “problem” is that I haven’t tested this theory out myself. Today I thought I’d shed some light on what has worked for me when syndicating my SEJ content on Medium and LinkedIn. The idea of this test came several months ago when I was interviewing for a position at HubSpot to manage their Medium account. While I didn’t get the job, I was still curious about this emerging platform Medium. Could I repurpose my old content on SEJ to Medium to increase pageviews, shares, reads, comments, etc.? The more I thought about the idea, the more I wanted to learn what might happen. I would repurpose a variety of my articles from SEJ to Medium and LinkedIn Pulse for one month posting twice a week on Tuesdays and Thursday. So, how did this affect SEJ? As you can see from the results compared to last year, our numbers are up! But, what was the effect from articles I used in this experiment have on the site? My shares, reads, and comments all increased over the course of one month. 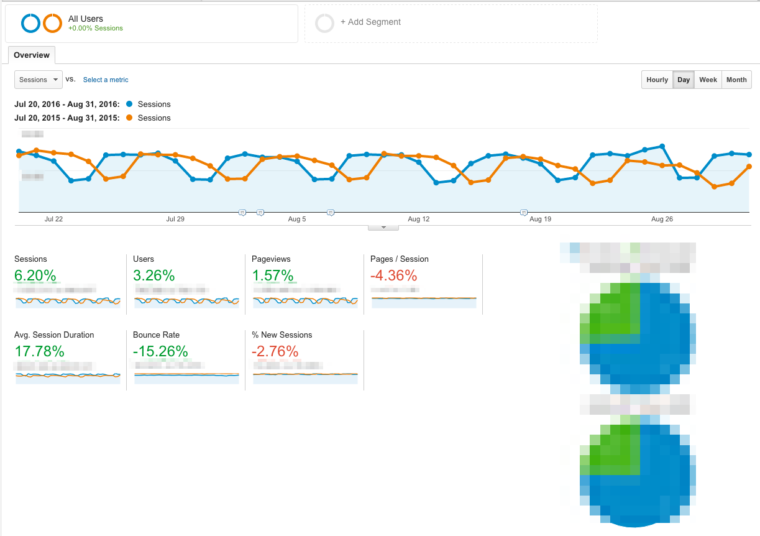 And, I increased pageviews by over 34% to SEJ in one month. 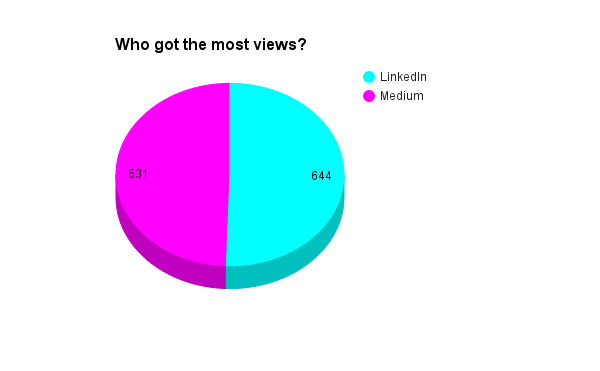 LinkedIn stumped Medium regarding views, but not by much. Either way, I got 1,275 new eyeballs on my writing from SEJ. 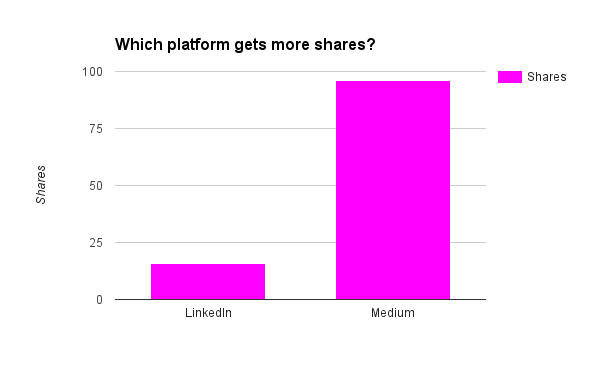 Users share more on Medium than on LinkedIn. 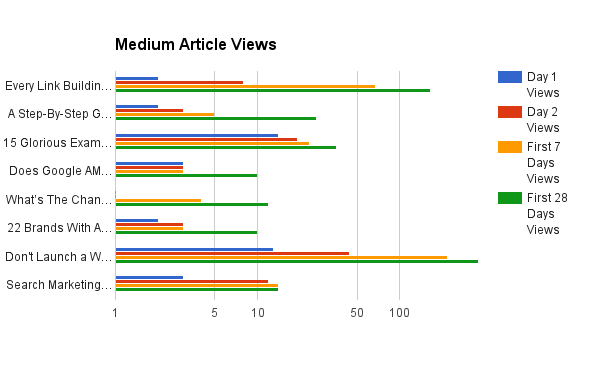 Articles do better over time on both platforms. 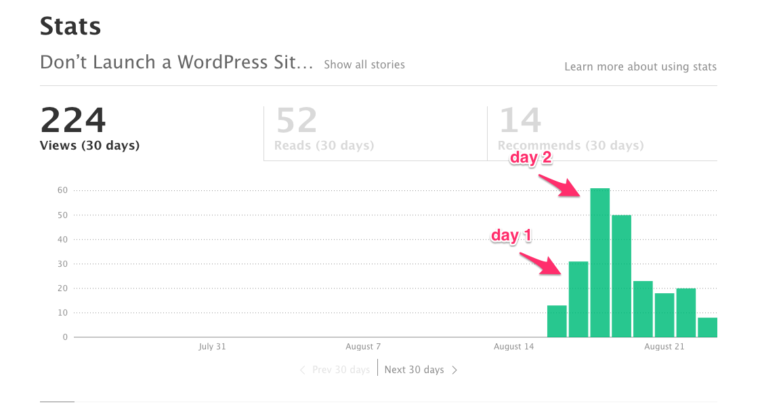 Take a look at the comparison below, the majority of my articles picked up pace after the first 28 days. As you can see, it pays to syndicate your content, and since I know that people are ready, willing, and able to engage with my content on SEJ, it’s smart to continue down the rabbit hole of syndicating my content to see if I can build a strategy. 1. Graphics are vital, but not necessary. I’m personally stoked about Instagram Stories and Snapchat emerging in the digital space, however, the data shows that my article on Instagram Stories that featured a listicle format where each number was coupled with embedded videos didn’t do so hot. Same goes for my piece on gifs. 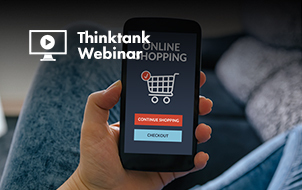 The lesson here could be to A/B test articles with static images, embedded images, and no images within the body copy to see what is more consumable on desktop and mobile to see how engagement is affected. And, this theory might prove out that content without images on Medium and LinkedIn Pulse is more digestible on mobile. However, I’d always leave room for header image at the top of the article. 2. 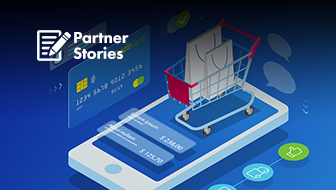 Each platform performs best with content unique to its audience. This can be a tricky one to conquer. Many brands repurpose content to Medium and Linkedin, but too often they are missing the reason for posting on these platforms. Driving traffic back to a site is a vital part of any content syndication strategy. But, if I can’t get views, shares, or engagement on my content, how am I supposed to increase traffic? It’s essential to know the differences between your audience likes, interests, and issues for each platform. For example, my article A Step-By-Step Guide to SEO for E-Commerce Websites bombed on Medium, and on LinkedIn it skyrocketed. LinkedIn is most likely responsible for the massive increase in pageviews. This article went up by 4,271 pageviews! Crazy, huh? And, take a peek at this article that was a personal story. This piece blew away all other articles listed in this experiment because of the tone, direction, and content specific for Medium readers. Plus, it got me accepted as a writer for my first Medium publication! Also, you’ll notice that some brands will alter their content calendar to incorporate some of the features of each platform. 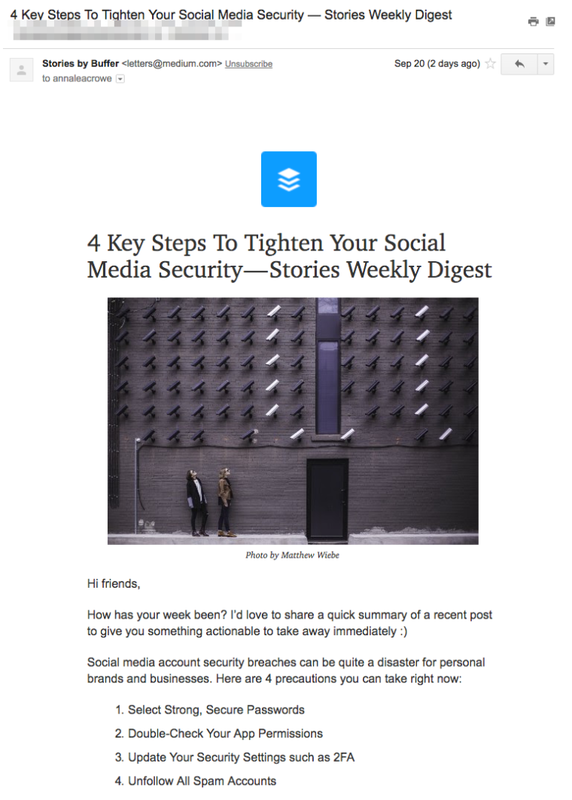 And, Buffer uses their weekly digest as a way to connect to readers inbox with Medium letters. 3. It pays to have friends. As with any marketing channel, it pays off to have friends. On Medium, gaining recommends, comments, and highlights within 24 hours of being published helps get you more attention and hopes of being included in the Editor’s Pick. 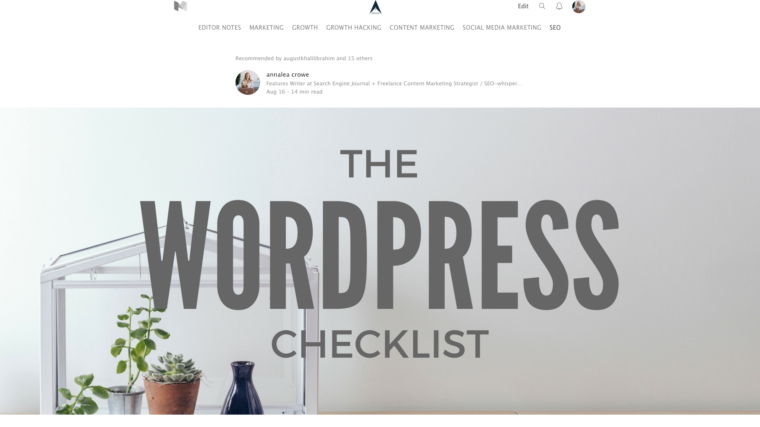 For example, my article Don’t Launch a WordPress Site Before You Go Through This Checklist got accepted to the Marketing and Growth publication on Medium. My views spiked from 13 to 44 in 24 hours. Thank you for including me, Lincoln Daniel! And, take a look at ReadThink (by HubSpot) engagement strategy. This article was posted five hours ago and already received 10 recommends on Medium. Can you guess where 8 out of 10 of those recommends came from? Yep, HubSpot employees. Internal marketing growth hacking at its best! 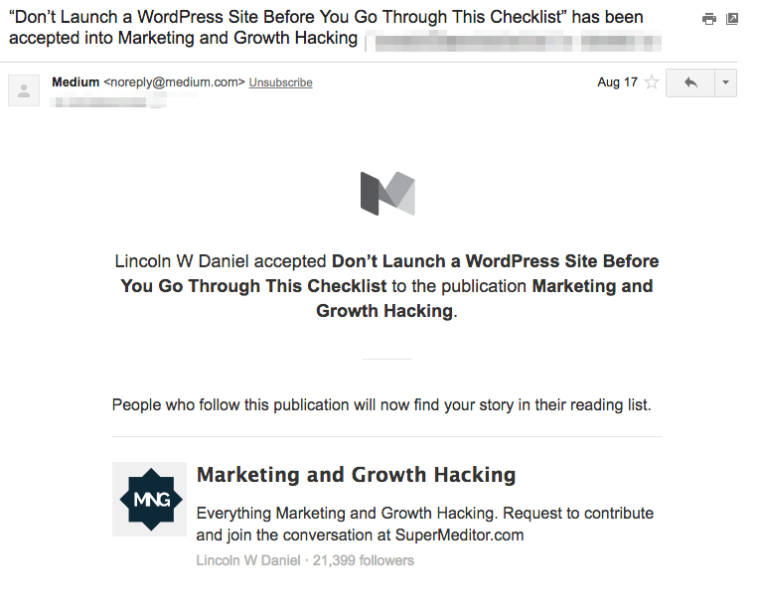 I took a risk and submitted my one of my Medium articles to the Marketing and Growth Hacking publication. I got accepted! I saw massive amounts of growth in a short time. And finally, I’ve put together a few additional thoughts I’d like to consider trying for Search Engine Journal over the next few weeks or months. If any of these ideas stand out to you, I’d love to hear your thoughts! Launch an SEJ publication open to guest writers. Write new short-form content including weekly digests. Repurpose top performing, relevant articles from a year ago or longer. Send Letters to SEJ Medium subscribers. Analyzing referrers from tag categories and tagging our brand name. Allow writers to republish SEJ content from one month ago or longer. Create consistent reposting calendar for SEJ partners Jenise and Loren to publish top performing articles on SEJ to their LinkedIn Pulse channels. Follow and engage with other LinkedIn Pulse writers posts. Write guest blog posts for top five sites I’d like to see SEJ featured on Fast Company, Entrepreneur, Huffington Post, Inc., and Next Web. Pitch same sites an opportunity to syndicate SEJ content. What visuals perform better on LinkedIn and Medium? What type of content on LinkedIn gets me featured in the Pulse? If I change the title of my article, will it perform better? What happens if I tag myself on Medium? How many email addresses can I gain on Medium by using Rabbut? I’ve been really churning my wheels to learn from all of you great writers and creators on Medium and LinkedIn over the past few weeks. I’d love to keep it going! If you have any tips or tricks to share about what has worked for you and syndicating your content, I’d love to hear about it in the comments. 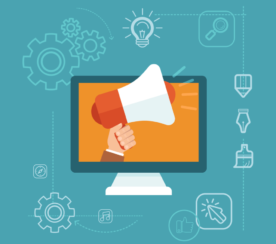 Are you syndicating or repurposing your content? If so, where? 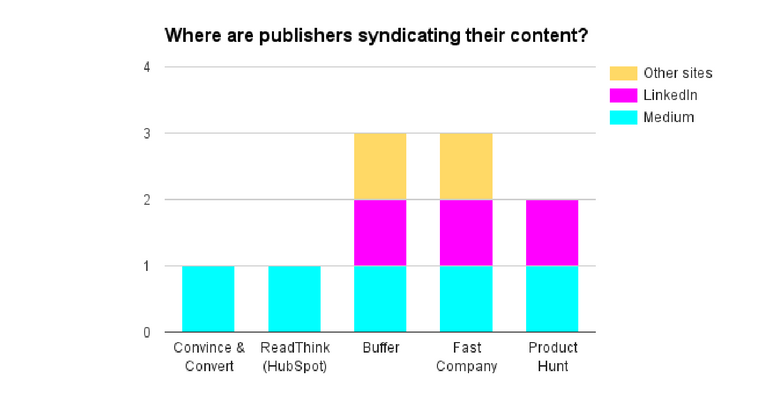 What type of content are you syndicating? How do you determine which content to share? Or, if you’re open to sharing your thoughts and ideas about SEJ using Medium, that’d be awesome too! All screenshots by Anna Crowe. Taken September 2016.